This Demonstration shows various geometric series based on the areas of squares. You can change the first term in the series by altering the size of the first square and you can vary the common ratio by using more than one color. 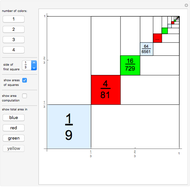 Options include displaying the areas of each of the first several squares and displaying the geometric series along with its sum. Marc Brodie "Geometric Series Based on the Areas of Squares"